Obsolete and discontinued replacement bidets by Trent Bathrooms, Armitage Shanks, Ideal Standard, Qualitas, Doulton, Twyford and Spring to name but a few. 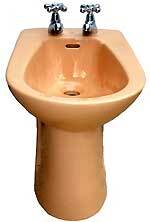 The wall-mounted bidet is fixed to the wall with a bracket and is exceptionally rare in old colours. The most common bidet is floor-mounted. As with the wall-mounted version it comes in one, two, or three tap-hole options. Special bidet-mixers are used with these products.